Two landowner companies on Lihir have been awarded commercial contracts to service Lihir Gold Limited (LGL). They are Anitua Drilling Services (ARDS) to provide mine drilling, and Noram to deliver stevedoring services for the Lihir operation. Benchmarked against LGL’s operating excellence program known as EDGE, which encourages best practice in contracts management and commercial transactions, the two companies came out winners with ARDS overcoming the open market competition to win the award, while Noram was measured internally for its success. According to LGL general manager, Craig Jetson, the two companies had to meet key performance indicators including benchmarked rates, workable contractor management frameworks and accreditation requirements. At a special LGL sponsored luncheon held recently to celebrate Noram’s achievement, Mr Jetson attributed the company’s success to the commitment and dedication of its Port Services employees at one of PNG’s best international ports. 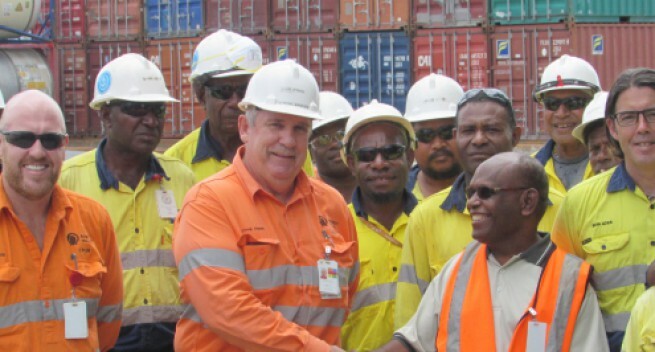 "The Noram contract award is a recognition of the dedication and commitment of you employees to deliver work-class stevedoring services at Lihir," said Mr Jetson.